Isn't it time to get out of the classroom? Perfect for day care, school field trips, school PTA events, youth groups, summer camps, or anyone who just wants to bounce! Our Field Trips are privately held for your group, and supervised by our trained and friendly staff. 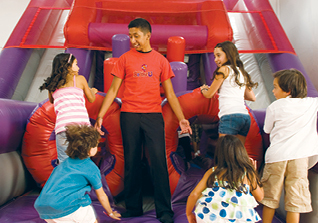 Events are priced based on number of kids and length of bounce time. We offer 60 minute, 90 minute, and 2 hour events. Lunch can be added on as well. For more information, please give us a call!